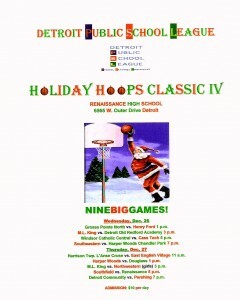 Some of the area’s best high school basketball players and teams will heat up the court Wednesday and Thursday, Dec. 26-27, in the fourth annual Detroit Public School League Holiday Hoops Classic at Renaissance High School. Admission is just $10 per day, with four big games slated for Wednesday and five more big games set for Thursday. The action tips off Wednesday at 1 p.m. with Henry Ford facing Grosse Pointe North at 1 p.m. followed by M.L. King against Old Redford Academy at 3 p.m., Cass Tech against Windsor Catholic Central at 5 p.m., and, in a premier matchup of top 10-ranked teams, Southeastern against Harper Woods Chandler Park at 7 p.m.
Thursday’s excitement starts with two boys’ games, East English Village against Harrison Twp. L’Anse Creuse at 11 a.m., and Douglass against Harper Woods at 1 p.m. The only girls’ game of this year’s event features the state’s No. 1-ranked King High Lady Crusaders against the Northwestern Lady Colts at 3 p.m. That game will be followed by two much-anticipated boys’ matchups, Renaissance against Southfield at 5 p.m. and the state’s No. 1-ranked Pershing High Doughboys against highly-touted Detroit Community in the 7 p.m. finale. Add some high-quality high school hoops to your holiday menu and feast on the Detroit Public School League fourth annual Holiday Hoops Classic next Wednesday and Thursday at Renaissance High School.